I saw lots of Backpacks up to 50% Off and even a few at 70% Off. 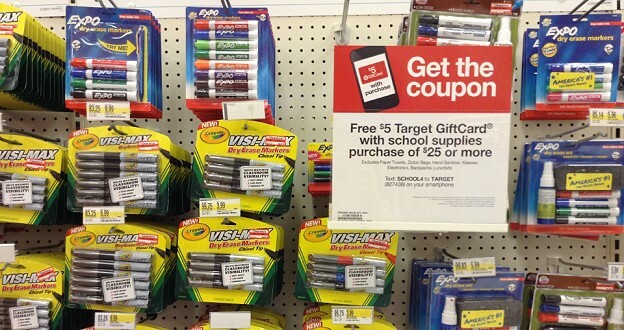 Back to school clearance is a great way to stock up for the following year on the cheap. If you are planning on picking up notebooks, be sure and keep an eye out for possible coupons inside. Some of the Mead notebooks this year had a sheet of coupons inside for Hanes, Elmer’s and more and they usually have quite a nice lengthy expiration date too. While $25 may seem like a lot to spend with all the clearance going on, you could share your shopping trip with a friend and split the reward. Plus you can check out the Back to School Target Cartwheel Category for offers- most of which do not exclude clearance. 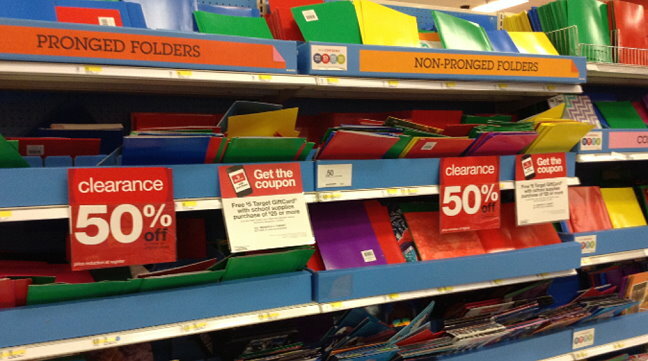 Oh, I’m trying to remember, do school supplies go to 90% off or stop @ 70%? The only things on clearance at our store on Sunday were backpacks and lunch bags. No crayons, erasers, etc. They’ve been out of folders for weeks! There wasn’t much left. Target Honolulu went 70 on some stuff yesterday, most backpacks and lunch pails were 50 and 30 off. Hopefully everything will go to 70 tomorrow including the banzai slip n slide items. I managed to pick up some 0.07 notebooks, $0.11 glue sticks, $0.85 scissors and $0.15 three prong folders. Ooooooooo!!!! Guess I’ll be making a run today to check! 😀 Great prices, Knox!!! 😉 Anyone else seen 70% off yet??? My Target in Chicagoland had some stuff 70%, 50% and 30%. Got some decent deals today paired up with coupons and cartwheel. I think my kids are set for the next few years now! Laura I believe my two local Targets (Virginia) went to 90% off last year. We are still at 70% at both stores.